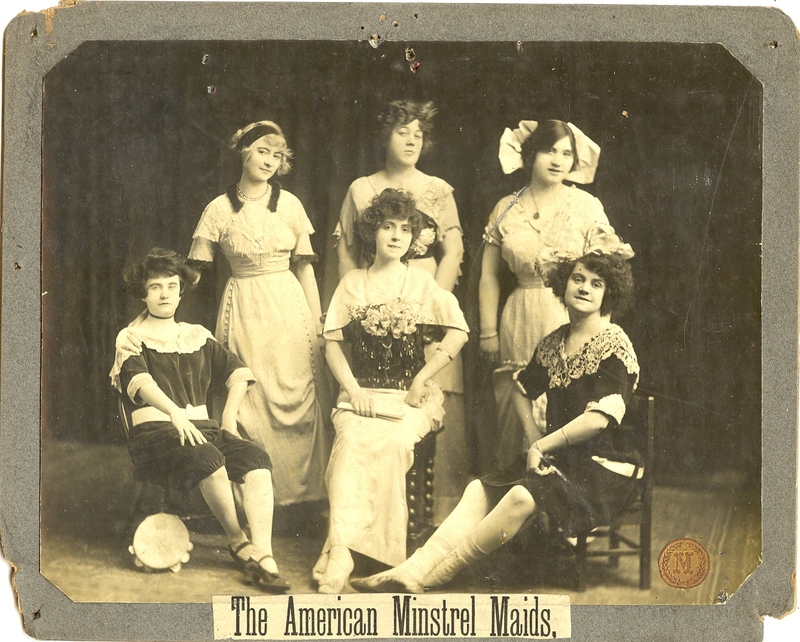 AMERICAN MINSTREL MAIDS VAUDEVILLE PUBLICITY PHOTOGRAPHS, CA. 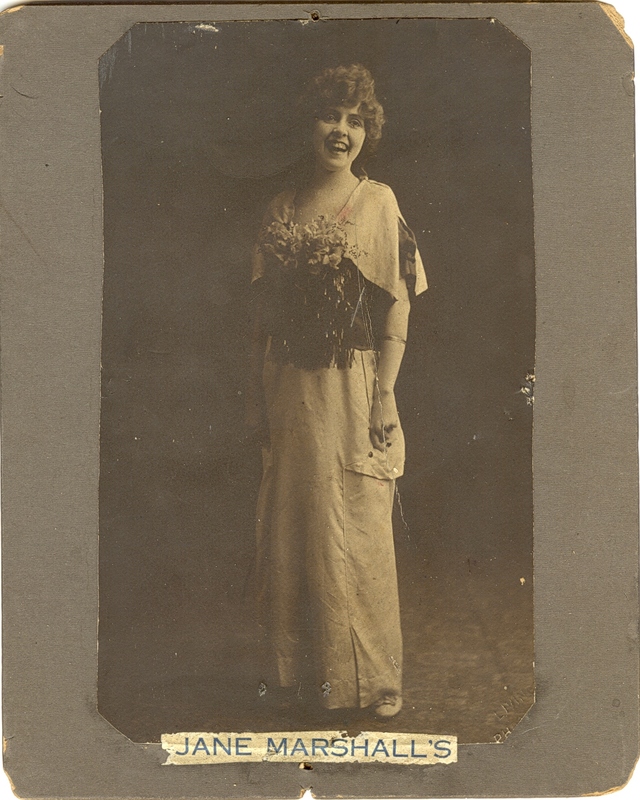 1915. I found this charming group of vaudeville publicity photographs in a shop in Rochester, New York at some time in the late 1990s. 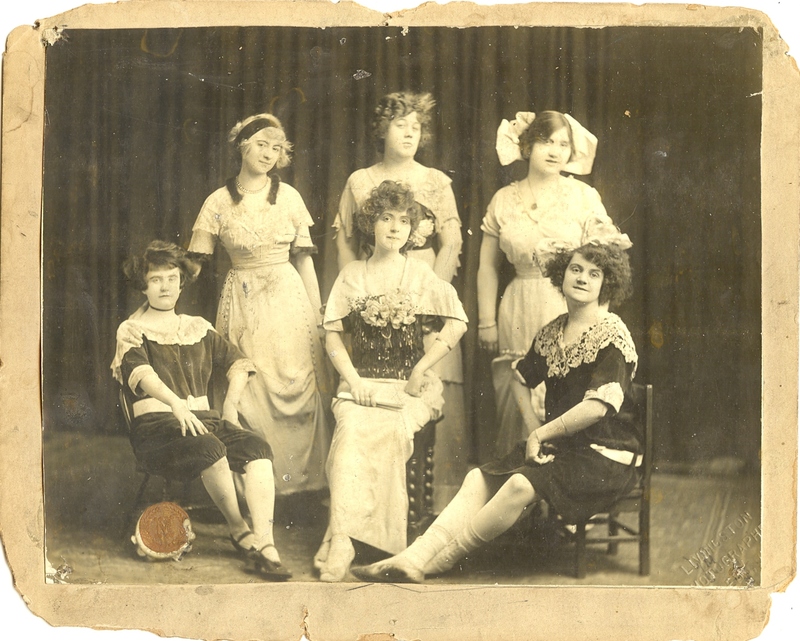 If anyone can provide any additional information about this group or a note about the history of small-town vaudeville, I would be grateful. 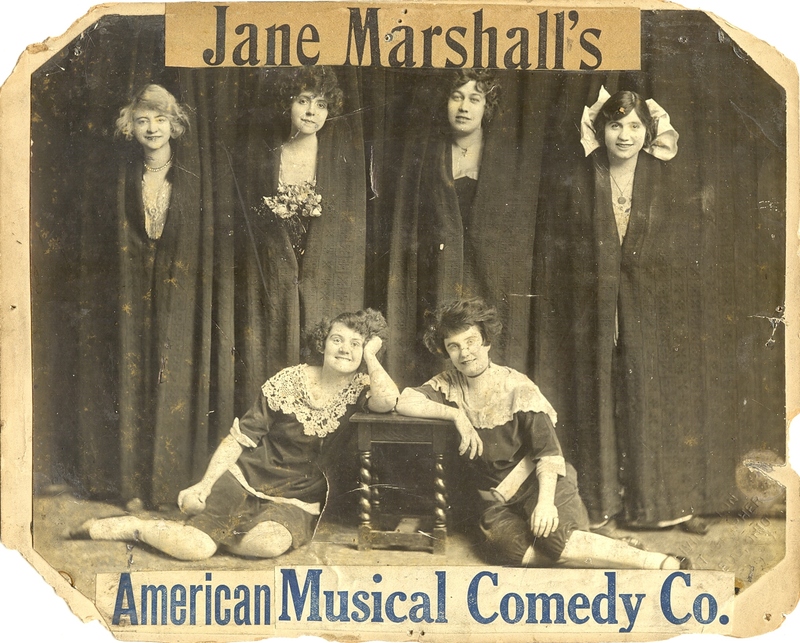 Jane Marshall's American Musical Comedy Co. 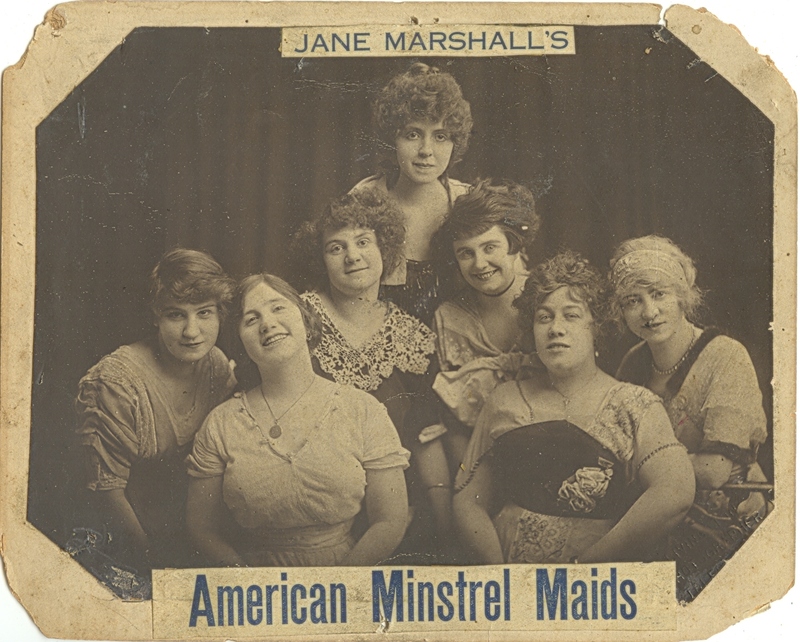 The group of photographs consists of fifteen publicity portraits of a vaudeville music group, named the American Minstrel Maids, which toured the American midwest from about 1915 to 1918. Vaudeville flourished throughout the country throughout the 19th century and in the first two or three decades of the 20th, before finally succumbing to the newer technological marvel of “moving pictures.” Musical and comedy groups organized and toured their live acts from town to town, and by the turn of the century almost every small city in the United States had a Vaudeville Theatre which presented a round robin of performances throughout the year by these travelling performers. Apparently these groups would usually tour within a reasonably specific geographical area and, if successful, return to the same theaters year after year. 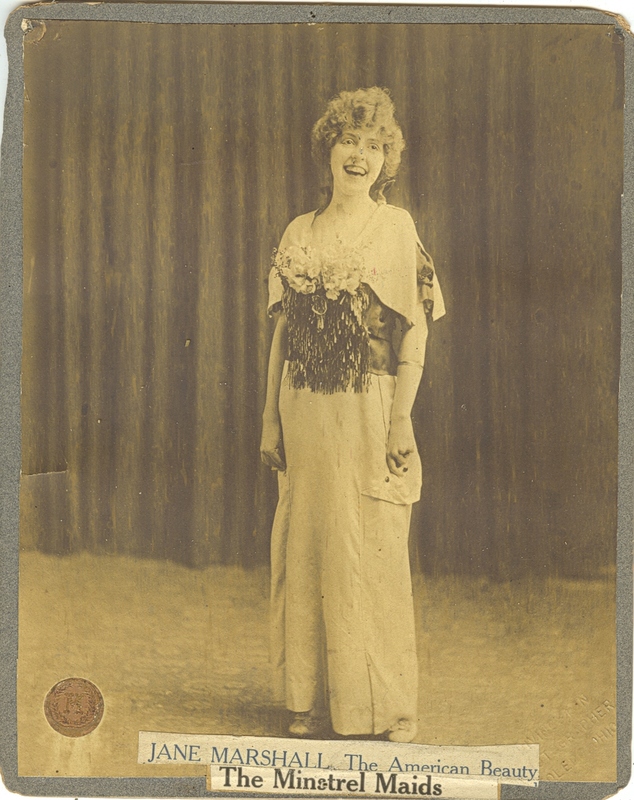 Although I do not claim to any expertise in the history of vaudeville, the little research I did on these photographs brought up some interesting items. First, while minstrel groups had existed in the United States from before the Civil War it seems that all-female groups began to be formed only around the turn of the century. And apparently a Mr. Marshall, who had been both a performer and a manager during the final decades of the 19th century, may have been the first or one of the first to organize an all-female group. If this is the same Mr. Marshall, then it may also be that Jane Marshall married into the business and then took it over after the much older Marshall died. Research in this field can be complicated because it seems that sometimes these groups adopted the same or very similar names, and occasionally two or more groups would overlap chronologically. There seems to have been at least a half dozen or so “Minstrel Maids” performing through the first years of the 20th century. 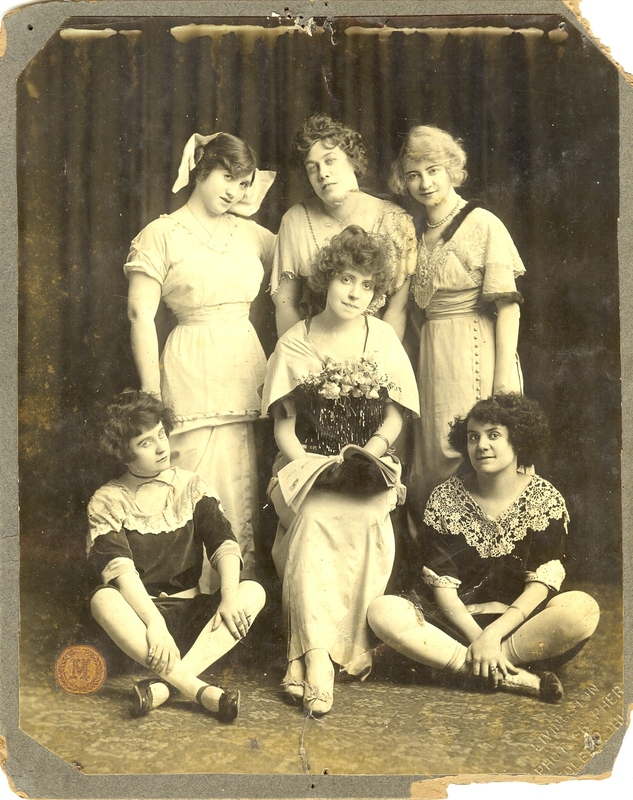 Most of these were too small or had been working the smaller towns to have been noticed in any “official” histories of vaudeville – but they do turn up in advertisements or reviews in the local newspapers. 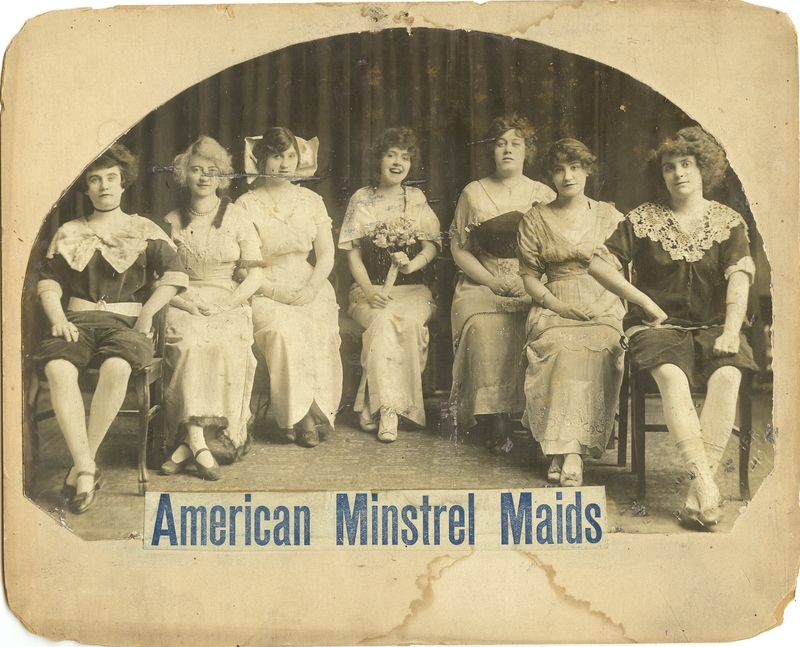 This group of “American Minstrel Maids” seems to have worked in the mid-west, touring through the smaller cities of New York, Ohio, and Pennsylvania; then circling back through the same region again over a period of several years. There was also a similarly named group touring throughout the West Coast and Northwest during approximately the same time. 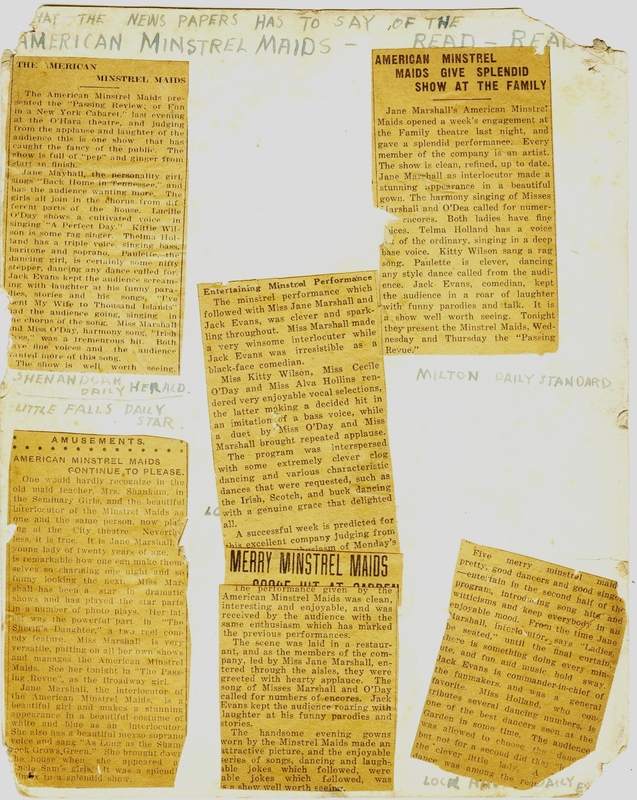 All but two of the photos are mounted on 8″ x 10″ cardboard backing, which were tacked up in the lobbies of the theatres when the group performed, then removed, taken to the next venue, and tacked up there. This explains the obvious wear and thumbtack holes. 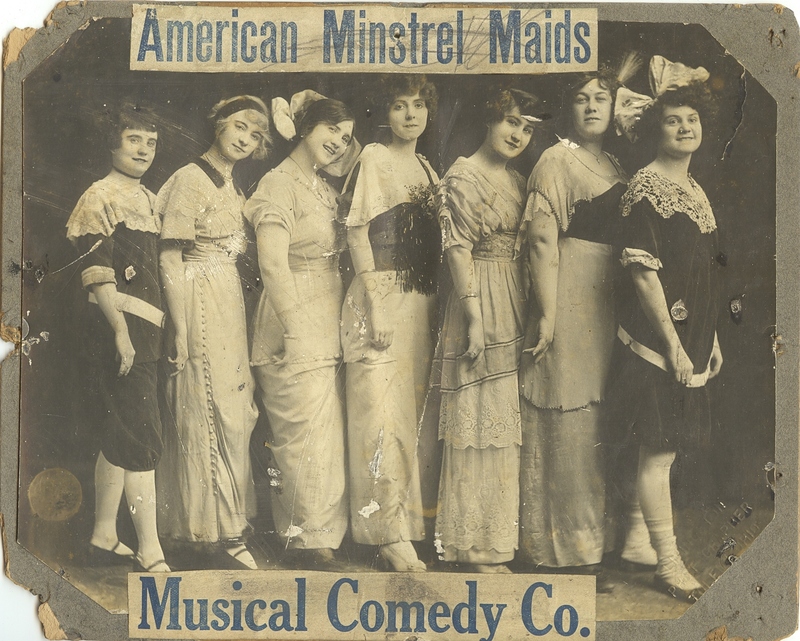 Minstrel Maids Musical Comedy Co.
What the News Papers has to say of the American Minstrel Maids -- Read -- Read. 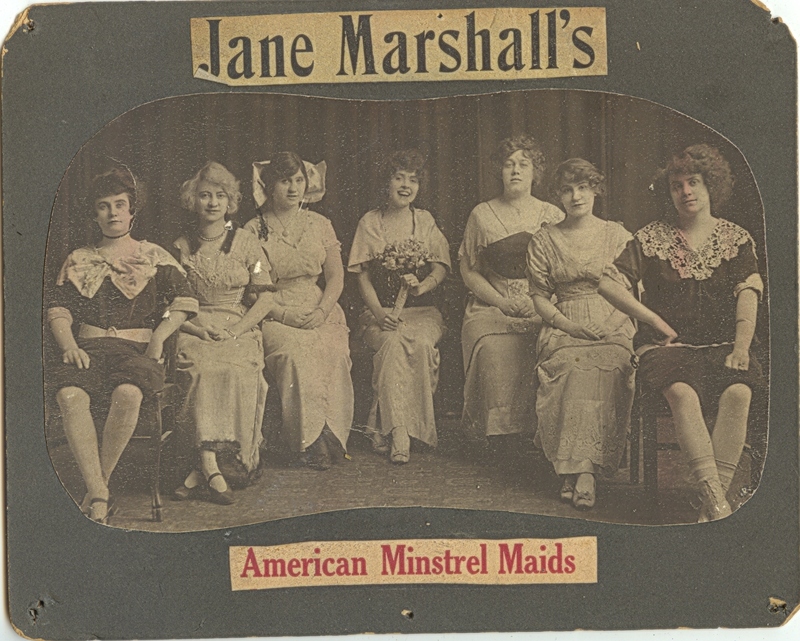 Jane Marshall's American Minstrel Maids. 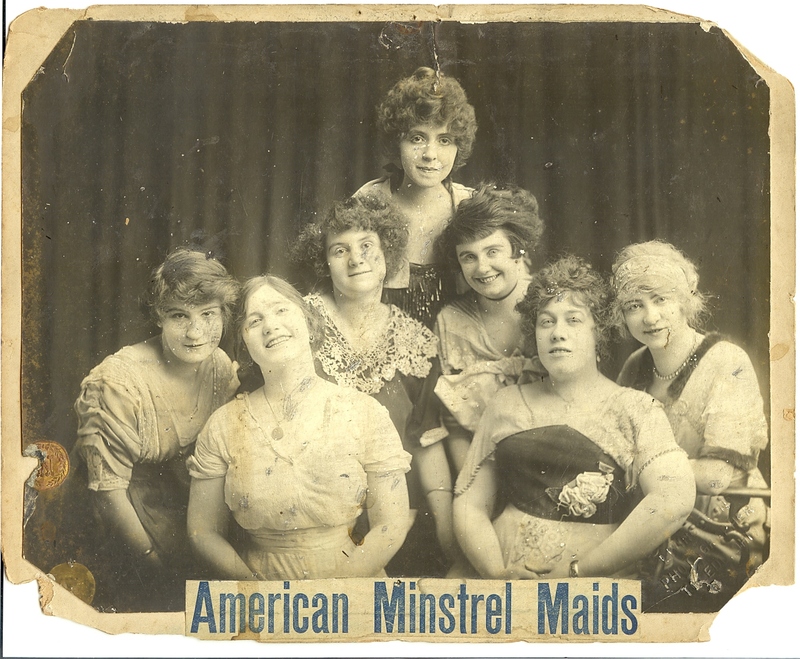 American Minstrel Maids. 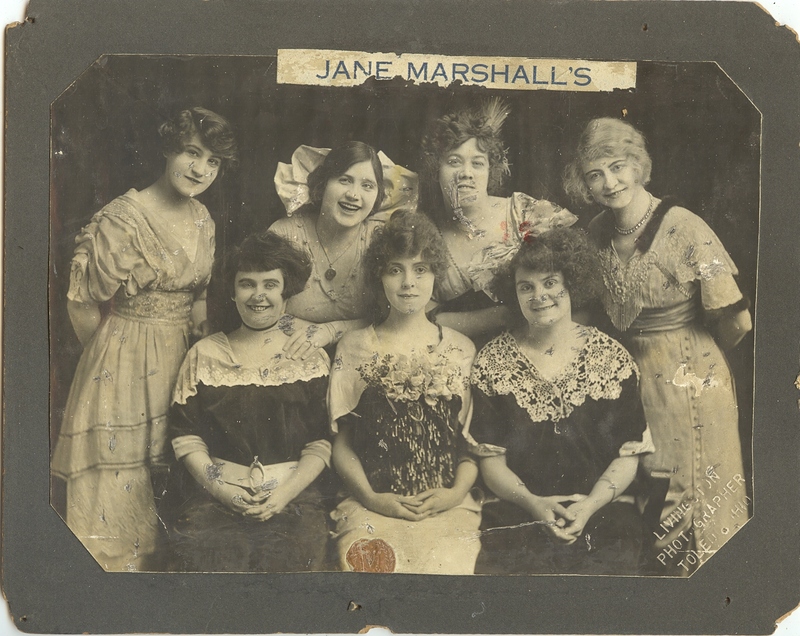 Musical Comedy Co.
Jane Marshall. The American Beauty. 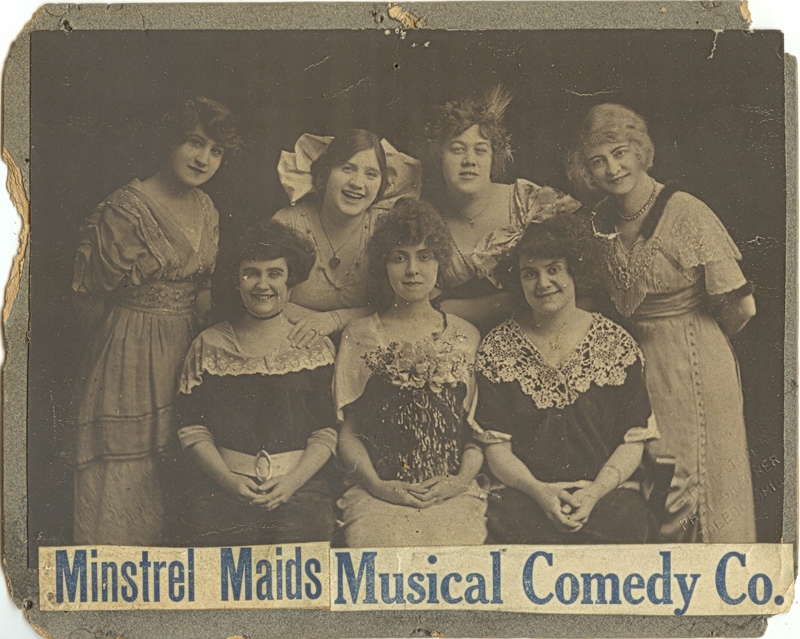 The Minstrel Maids. Several of these prints have a studio blind-stamp for “Livingston, Photographer, Toledo Ohio,” in the lower right corner. I know nothing more about Mr. Livingston. I also have no idea what the little gold medallions represent that are stuck onto some of the photographs. Perhaps they were some form of award given out by the vaudeville houses for good performances. 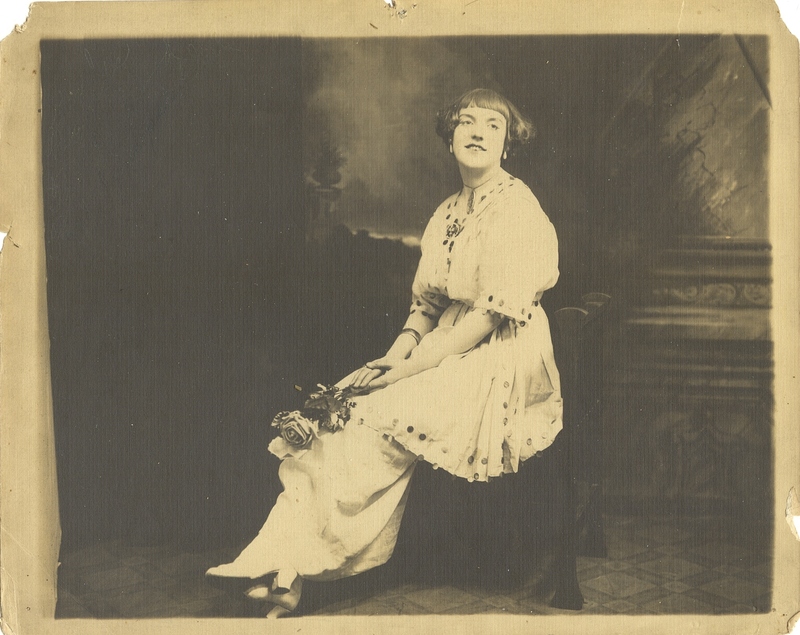 The two unmounted prints are a seated portrait of Jane Marshall with a painted backdrop background, and the second, a portrait of another performer, with the handwritten inscription “With Regards from Flo Rockwood, that Syncopated Girl,” on both the front and verso of the print. 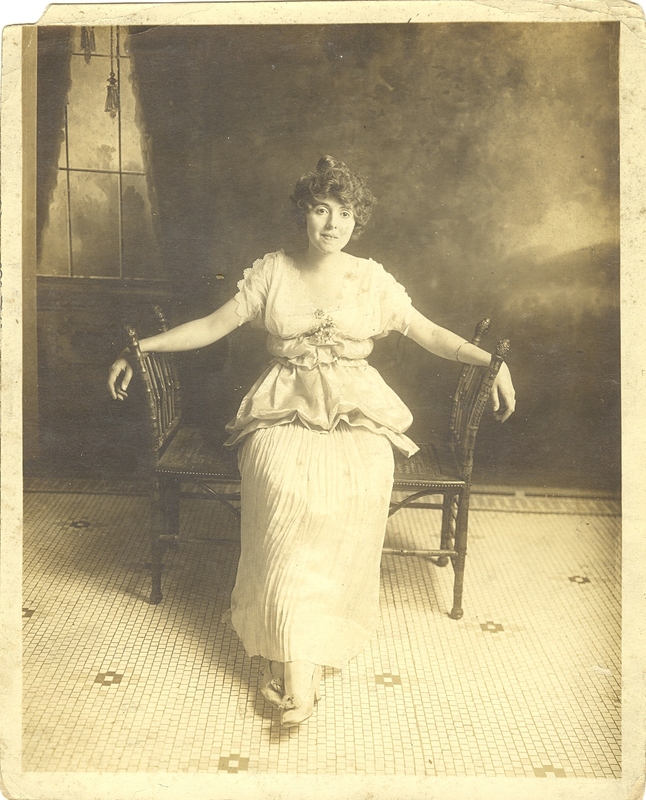 Untitled Portrait of Flo Rockwood. 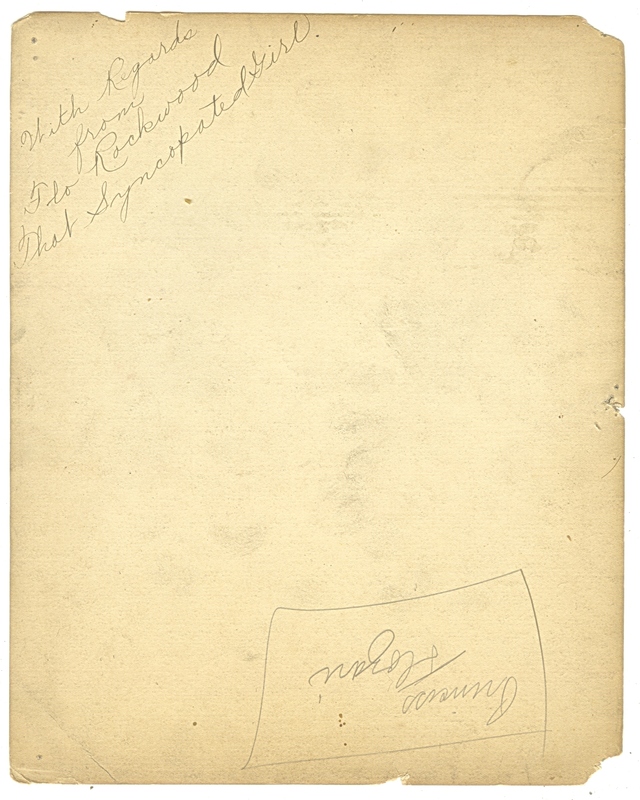 Verso of print of Flo Rockwood portrait.